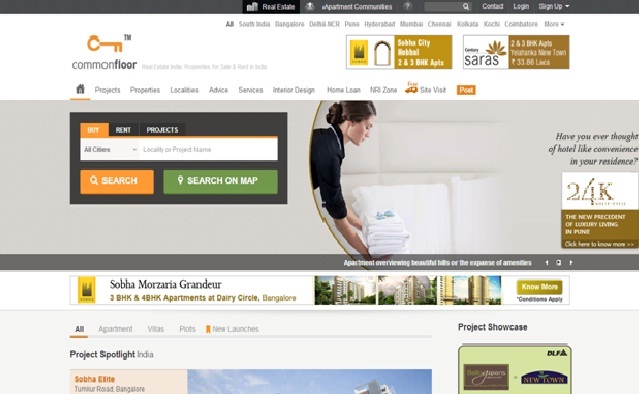 Commonfloor.com is India’s first real estate portal dedicated to apartments and communities. This website gives all the property related news in India. You get information about hot properties with hot localities in India like Bangalore – Hebbal, Whitefield, JP Nagar, Yelahanka, Dasarahalli, and Electronic city, Hyderabad – Secunderabad, Kondapur, Gachibowli, Madhapur, Miyapur, and Kukatpally, Chennai – East Coast Road-ECR, Red Hills, Tambaram, OMR Road, Anna Nagar, and Medavakkam. For any assistance, call at 1800 180 180 180 and for sale queries call at +91-80954 00603 (North India), +91-96202 06060 (South India).